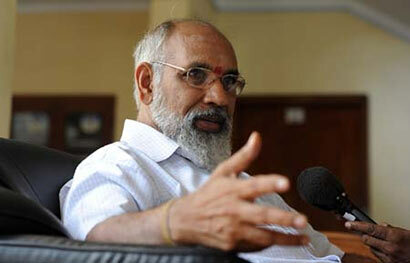 Chief Minister of the Northern Province, C.V. Wigneswaran, in a bold statement, said the Tamil speaking people in the North were not against the Sinhalese per se, but were against the ‘Sinhalization’ of the island’s North and East. Addressing the Annual General Meeting of the Sarvodaya Movement on Saturday (21), he said it was the duty of the Sinhalese in the South to raise their voice against the presence of the military in the North.“We have no doubt that the Army is stationed in the North with ulterior motives. We see it taking place. Our lands are being grabbed. Our businesses are being grabbed. Our employment opportunities are being grabbed. How long does the government want to keep its military forces in the North? These are questions which must be posed by reasonable, ordinary, humane Sinhalese in the South. It is indeed their duty to do so,” he said. Making claims that some were concerned over the safety of his life, Wigneswaran said he had received information regarding an ominous, neo- LTTE outfit in the North. “The latest we hear is that a former LTTE military commander is being commissioned to restart an LTTE outfit, subservient to the powers that be. Thus the ‘White Van’ drama could now be enacted by a different cast,” the Chief Minister of the Northern Province said. He also blamed the media for fermenting tension between factions, which in his opinion was an act of irresponsibility. He also claimed that he was not against the country’s Sinhalese coming to the North. “I get misquoted or misunderstood many a time. If I say we must have a civilian governor, the media says I am trying to oust the Governor. I have nothing personal against the Governor. If I say please allow a Math teacher to teach Mathematics to my son, and not a Chemistry teacher to teach him Math, does it mean I am against the Chemistry teacher? Similarly I am asking for a civilian governor; not a former military person. Therefore, when I say withdraw the Army from the North, it is said that I am against the Sinhalese coming to the North,” he said. Dev,You are wrong.Tamils back to north means .SEPERATION.People from south must have right to settledown, visit or start business in wherever they like,including the north.The north is a part of Sri Lanka,not India. CVW is being illogical making false analogies. On the one hand he warns of neo-LTTE rising up, and on the other hand he wants the GOSL defence bases in the N to pull out. N is not another country, as he is trying to make out with his duplicity. Shame on you CVW, retired judge! You have been brainwashed to be a radical Tamil separatist. SL is one country with one nation. All nationals of all communities are free to settle down where ever they like in SL. So stop this nonsense of calling N & E for Tamils only! When you were a Supreme Court judge in the S you did not make such claims, as you appreciated the free education you receive in SL even tertiary education, that helped you to become a SC judge free of racial discrimination. What ever happened we should not trust these people,Srilanka is a one united country with one national Anthem..and one national FLAG.Therfore all Srilankan should wakeup and we should fight for our tiny land.